To claim this profile, please confirm you are Luke Mcmahon. To follow this profile, please let us know your relationship to Luke Mcmahon. RESULTLoss Boys varsity lacrosse vs. Minisink Valley. The Bishop Timon-St. Jude varsity lacrosse team lost Thursday's home non-conference game against Minisink Valley (Slate Hill, NY) by a score of 5-4. RESULTWin Boys varsity lacrosse @ UCCHS. The Bishop Timon-St. Jude varsity lacrosse team won Tuesday's away non-conference game against Upper Canada College (Toronto, Ontario) by a score of 8-4. RESULTLoss Boys varsity lacrosse @ CBA. The Bishop Timon-St. Jude varsity lacrosse team lost Saturday's away non-conference game against Christian Brothers Academy (Syracuse, NY) by a score of 27-3. The Bishop Timon-St. Jude varsity lacrosse team lost Thursday's home conference game against St. Joseph's Collegiate Institute (Buffalo, NY) by a score of 16-6. RESULTWin Boys varsity lacrosse vs. Nichols. The Bishop Timon-St. Jude varsity lacrosse team won Tuesday's home conference game against Nichols (Buffalo, NY) by a score of 6-5. RESULTWin Boys varsity lacrosse @ McDowell. The Bishop Timon-St. Jude varsity lacrosse team won Saturday's away non-conference game against McDowell (Erie, PA) by a score of 13-4. RESULTLoss Boys varsity lacrosse vs. Canisius. The Bishop Timon-St. Jude varsity lacrosse team lost Thursday's home conference game against Canisius (Buffalo, NY) by a score of 10-8. RESULTLoss Boys varsity lacrosse @ St. Francis. The Bishop Timon-St. Jude varsity lacrosse team lost Tuesday's away conference game against rival school St. Francis (Athol Springs, NY) by a score of 9-7. RESULTWin Boys varsity lacrosse vs. Cathedral Prep. 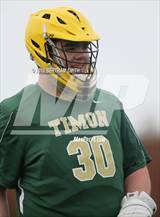 The Bishop Timon-St. Jude varsity lacrosse team won Saturday's home non-conference game against Cathedral Prep (Erie, PA) by a score of 13-5. Luke's lacrosse stats have been updated for the win @ Kenmore West. RESULTWin Boys varsity lacrosse @ Kenmore West. The Bishop Timon-St. Jude varsity lacrosse team won Thursday's away non-conference game against Kenmore West (Buffalo, NY) by a score of 16-2. Luke has been added to the Bishop Timon-St. Jude lacrosse roster. Luke was tagged in the video "Junior Year-Luke McMahon: All Offense." Luke was tagged in the video "Luke Mcmahon's highlights Cardinal O'Hara." Luke was tagged in the video "Luke Mcmahon's highlights St. Joseph's Collegiate Institute." Luke was tagged in the video "Luke Mcmahon's highlights Cardinal O'Hara High School." Luke was tagged in the video "Luke Mcmahon's highlights St. Mary's High School." RESULTLoss Varsity football vs. Cardinal O'Hara. The Bishop Timon-St. Jude varsity football team lost Saturday's neutral playoff game against Cardinal O'Hara (Tonawanda, NY) by a score of 32-6. This game is part of the "2018 Fall Boys Football New York Monsignor Martin State Tournament - Class B".